The Solovets Islands, commonly referred to as Solovky in Ukrainian, boast Mt. Sekirnaia, a gem of the northern environs. It is a captivatingly scenic spot, but here you must behave as though you are on a visit to a cemetery. In summer, its slopes teem with bilberry bushes, but you should not pick the berries. The same goes for the flowers and mushrooms: look but don’t touch. Nor can you shout or sing in this special kind of forest: there are so many people buried here, it’s best to leave their final resting place undisturbed. Nov. 3, 2007. Looking at the calendar, I remembered the events that took place one decade ago in Arkhangelsk. I was in the archives of the regional office of the Federal Security Service of the Russian Federation, looking through Soviet prison camp inmates’ files from the 1930s. I came across an old album with photos of the minutes of a troika, a special commission of three people authorized by the USSR’s NKVD Directorate of Leningrad oblast to condemn people to death without judicial proceedings. A document (no. 83) dated Oct. 9, 1937, entitled “Protokol” (Minutes), listed the names of condemned Ukrainian scholars, writers, cultural figures, and statesmen, among them Atamaniuk-Yablunenko, Vorony, Epik, Zerov, Irchan, Krushelnytsky, Kulish, Kurbas, Lozynsky, Pavlushkov, Pidmohylny, Polishchuk, Poloz, Rudnytsky, Slisarenko, Yavorsky, and Yalovy — the elite of Ukraine’s “Executed Renaissance.” The album also listed the names of people who had been accused of political crimes: Russians, Poles, and Georgians. There were Orthodox, Roman Catholics, and Muslims, intellectuals, peasants, and factory workers. One document alone listed 266 names. Seventy years ago such documents had lethal force. Under every name the typewriter typed the same spaced-out word combination in the upper case: TO BE SHOT. This 58-page document, listing the names of the inmates of the Solovky maximum security prison (STON) who were condemned to death by the troika, was signed by Zakovsky, Gorin, and Pozern. In accordance with Protokol no. 83, firing squads had to execute “134 Ukrainian bourgeois nationalists sentenced to various prison terms on charges of counterrevolutionary, nationalist, espionage, and terrorist activities in Ukraine, who, while maintaining their earlier counterrevolutionary positions and continuing espionage and terrorist activities, had founded the counterrevolutionary All-Ukrainian Central Bloc.” Both the executioners and their victims knew that there was no such bloc in Solovky Prison. Instead, there were some inmates of such strong spirit that they rejected the imperialistic authorities and communist ideology. They were conscious fighters, patriots, and worthy sons and daughters of their nation. On the other side of the barbed wire and barred windows Moscow handed down decisions aimed at cleansing Soviet society of all “counterrevolutionary elements.” There were two quota categories for repressions: Category 1 and Category 2 (1 meant the firing squad; 2, imprisonment). There was also an “armed detachment of the Communist Party” — the organs of the Cheka-GPU-NKVD, which were tasked with executing the Kremlin’s murderous resolutions. In October 1937 alone, there were five execution lists issued in Solovky, totaling 1,116 inmates. Of them 1,111 were shot at the tract of land known as Sandarmokh near Medvezhegorsk (Karelia) between Oct. 27 and Nov. 4. The “Ukrainian bourgeois nationalists” listed in Protokol no. 83 were executed on Nov. 3. 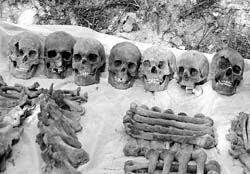 Two large convoys of STON inmates (Ukrainians among them) were massacred in December 1937 and February 1938. The location of the last two execution sites are still being sought in the vicinity of Saint Petersburg (Rzhevsk testing range and the Koirankangas wasteland) as well as on the archipelago that is an administrative part of the Primorsky Krai area of Russia’s Arkhangelsk region. 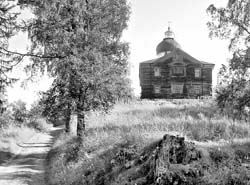 Commissioned by the Solovets Memorial Preserve, Karelia’s nonprofit regional organization, the Academy of Social and Legal Defense, dispatched an expedition to the various areas in the largest of the White Sea islands in July-August 2006. In the vicinity of the Ascension Church, which once housed the prison camp’s penal isolator, near Mt. Sekirnaia, the expedition’s head Yurii Dmitriev and his assistant, the Petrozavodsk-based writer Vassili Firsov, investigated suspicious depressions in the ground in the local woods during their search for burial or execution sites dating to the 1920s and 1930s. They found several (more on this later), yet no one knows how the firing squads disposed of almost 200 bodies after the massacre on Feb. 17, 1938. The builders of communism tortured and murdered their victims on these holy grounds, “with an iron hand driving mankind toward happiness.” Atop this legendary mountain camp inmates were flogged, but not in an angelic manner. One camp commandant would come here to relax by shooting prisoners. Another kind of torture was to strip an inmate and expose him to clouds of mosquitoes or make him seat on a wooden rod. If he fell off, exhausted, the guards would beat him senseless. Seeking to escape the fierce cold, prisoners slept in the church in stacks, and not all who found themselves at the bottom lived to see the morning. Researcher Yurii Dmitriev, who worked on Mt. Sekirnaia in 2005-06, said a pit was found with the remains of 26 bodies on July 19, 2006 (www.solovki-monastyr.ru says July 20). The skeletons were lying one on top of another in layers. Some of the skulls had bullet entry wounds. There were also rifle and pistol cartridges, one of them from a Browning pistol, and nonmetallic household items like shoes, buttons, and a comb. That same day the researchers, after studying and listing the finds and attending a mass celebrated by monks from the Sviato-Voznesensky (Ascension) Monastery, placed the bones in two coffins, buried them, and covered the execution site with earth. On other days these same Karelian researchers discovered several other pits filled with the remains of bodies bearing signs of violent death (gunshot wounds to the back of the head) elsewhere on Mt. Sekirnaia. Researchers often discover facts in camp inmates’ letters, eyewitness accounts, and archival case files, which are hard to believe. It took Solovky camp inmate Professor Aleksei Wangenheim (of Dutch parentage), a renowned scientist who organized the USSR’s Hydrometeorological Service), four years to learn the charges against him. The Ukrainian Mykola Pavlushkov had the misfortune of spending time in the isolator on Mt. Sekirnaia. A court in Kharkiv handed down a prison sentence of 10 years to him and other defendants in a case fabricated by the GPU, which alleged that they were involved in the nonexistent organization called Union for the Liberation of Ukraine (SVU). In 1930, the newspaper Bilshovyk Ukrainy (Bolshevik of Ukraine) wrote that the proletarian court had tried “all of Ukrainian nationalism, nationalistic parties and their ideas of Ukraine’s bourgeois freedom and independence.” Seven months after being transported to the prison camp, the 30-year-old Pavlushkov sent a statement to the Collegium of the OGPU USSR (April 1934) that reads in part: “My living conditions became bearable only after our isolator was moved from Mt. Sekirnaia to Savvatievo.” Given the uncontrollable arbitrary rule of the proletarian “educators,” this “acceptability” was relative. Pavlushkov was not allowed to correspond with relatives or friends; he was refused all visits. At first he and other inmates were “fed” promises and told that in winter it is hard to maintain telephone contact with the mainland. Pavlushkov tried to defend his rights by going on a hunger strike, and only on the 18th day did he learn that he was denied the right to correspond. No one bothered to explain who had deprived him of this right, or when or why. A year passed and the situation remained the same. Prisoner Pavlushkov wrote in a statement addressed to the head of the 3rd Department of the NKVD’s White Sea-Baltic Combine: “Once again I am asking you to put an end to my intolerable situation.” The situation of Pavlushkov, Wangenheim, and the more than 1,800 other political prisoners was finally “rectified” during the Great Terror: they were all executed. The mass shootings, which began in mid-November 1937, preceded the festivities commemorating the 20th anniversary of the October Bolshevik coup. The “Solovets authorities” embodied the imperialistic power and defective communist ideology. In independent Ukraine we must remember Mt. Sekirnaia, Sandarmokh, Bykivnia, the Siberias and Magadans, the Holodomor genocide, the horrors of the Terror and political barbarism. We must remember all this so that we can prevent the danger of repetitions. In signing Edict No. 431/2007 “On Measures in Connection with the 70th Anniversary of the Great Terror: Mass Political Repressions of 1937-1938,” President Viktor Yushchenko of Ukraine ordered the Cabinet of Ministers of the Autonomous Republic of the Crimea, and the regional, Kyiv, and Sevastopil city state administrations to arrange for mourning rallies on Nov. 3-4, 2007, on the burial sites of victims of the repressions, and for ceremonies to lay wreaths at the foot of such monuments, and other events. One such event takes place at 5:00 on Nov. 2 near the monument to Les Kurbas, which stands at the intersection of Pushkin and Prorizna streets in Kyiv. Traditionally, those who cannot attend light candles at home. Serhii Shevchenko is a Merited Journalist of Ukraine.